Game description: Guitar Hero III: Legends of Rock drops you into the spotlight of the largest and most legendary rock concert ever. The star-studded soundtrack includes master tracks by such legendary artists as Guns N' Roses, The Rolling Stones, Beastie Boys, Muse and Pearl Jam, with added songs as made legendary by Kiss, Alice Cooper and Heart. Now drop that air guitar, tune your exclusive new Les Paul Guitar Controller and shred the night away with Guitar Hero III: Legends of Rock. 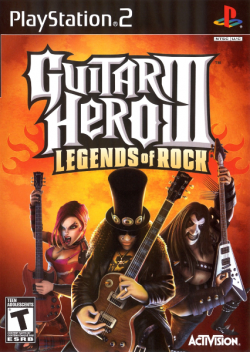 Guitar Hero III: Legends of Rock retains the basic gameplay from previous games in the Guitar Hero series, where the player uses a guitar-shaped controller to simulate the playing of lead, bass, and rhythm guitar parts in rock songs by playing in time to scrolling notes on-screen. The game, in addition to existing single-player Career modes, includes a new Co-Op Career mode and competitive challenges that pit the player against in-game characters and other players. Picture is sliced in gsdx hardware mode. Looks fine in software mode. Graphical glitches happen as soon as any song starts if using DirectX on hardware, then emulation will be stable for a short amount of time until spikes of hanging happen and PCSX2 crashes. Everything else seems to work fine. Game is playable with rare slowdowns that may reduce emulation speed down to at most 60%, for short amounts of time (perhaps due to processor termal throttling). Using 2nd emulation preset, plus EE cyle rate set as -3 and VU cycle steal rate set as 3 seems to offer the best performance in software mode renderer. Description: Game crashes at certain points during playthroughs. Workaround: Update to the latest developer builds and enable Automatic Gamefixes. Description: The audience may have corrupted sprites in certain parts of any song and/or the band member can be seen slightly blurry when using any hardware renderer with GSdx. Workaround: Use a software renderer instead. Beware this might reduce the emulation performance significantly if you don't have a powerful enough processor for the task. This page was last edited on 25 May 2018, at 20:52.